The first, of what I hope to be many, PNW storm arrived yesterday. As the snow fell, we cuddled up in our home, lit a Duraflame log (yes, we forgot to order wood!) and started experimenting with winter cocktails. My husband is kind of a cocktail buff. Well, he's buff and he likes cocktails- does that equate to a cocktail buff? Searching the web, he suddenly came across the Winter Bourbon Smash. Away he went to the kitchen, rifling through our fridge, liquor cabinet, shaking, stirring and finally, sipping! The drink was a total success- wintery, yet refreshing and not overly sweet. The reason I love this recipe (thank you, Minimalist Baker for posting), is there is a major cheat in it, that is quite perfect for days when you’re snowed (or iced) in. Instead of making a fresh fruit puree, the recipe calls for berry preserves, aka, that jar of jam that is in just about everyone’s fridge. We made the cocktail two ways- one with raspberry jam and other one with leftover homemade orange cranberry sauce! I preferred the later as the sauce had accents of nutmeg and cinnamon. However, just about any jam, preserve, or jelly will do. I would say our first snow day was a complete success. We drank our Winter Bourbon Smash's, watched countless re-runs of The Office and even made it out for a quick and very chilly walk around our neighborhood to check out the snow that quickly turned to ice. 1. 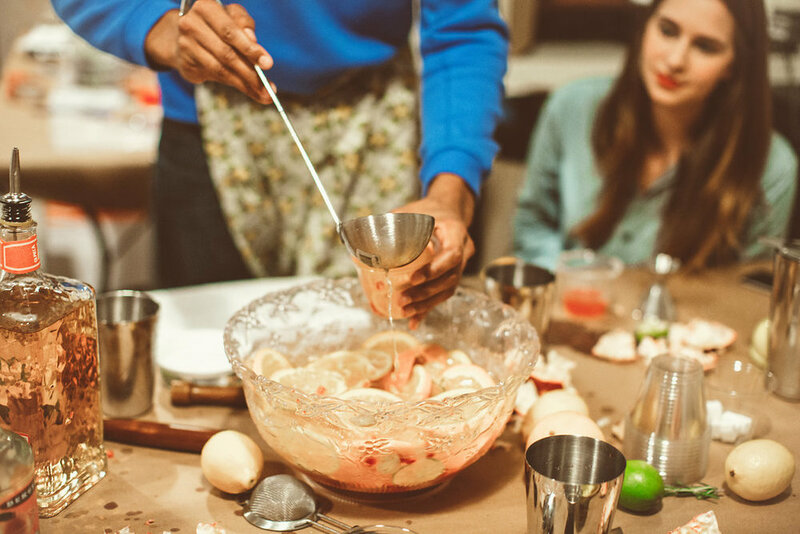 Add 1/2 cup ice, preserves, bourbon, triple sec and orange juice to a shaker and shake vigorously for 15 seconds. 2. Pour into serving glass with a few ice cubes and top with a splash of club soda. Garnish with an orange slice and enjoy. Hope everyone is staying safe and warm this holiday season. And when you try out the Winter Bourbon Smash, make sure to finish it off by eating that boozy orange peel at the end! Looking for a delicious Christmas or New Years cocktail to serve to your family and friends? I have two recipes to make you swoon with holiday delight. 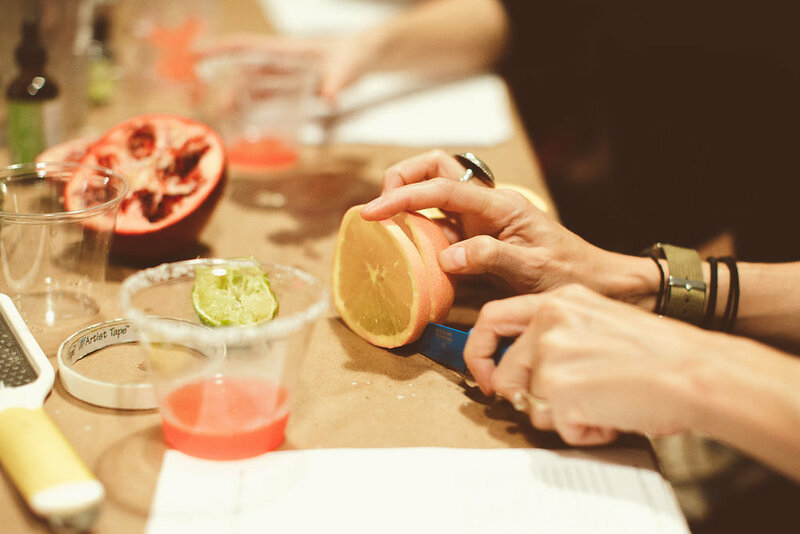 I recently had the pleasure of taking the Pomegranates Cocktail Workshop by Mint & Mirth. If you’ve yet to try their incredible concoctions, I highly recommend booking them for your next event or gathering. 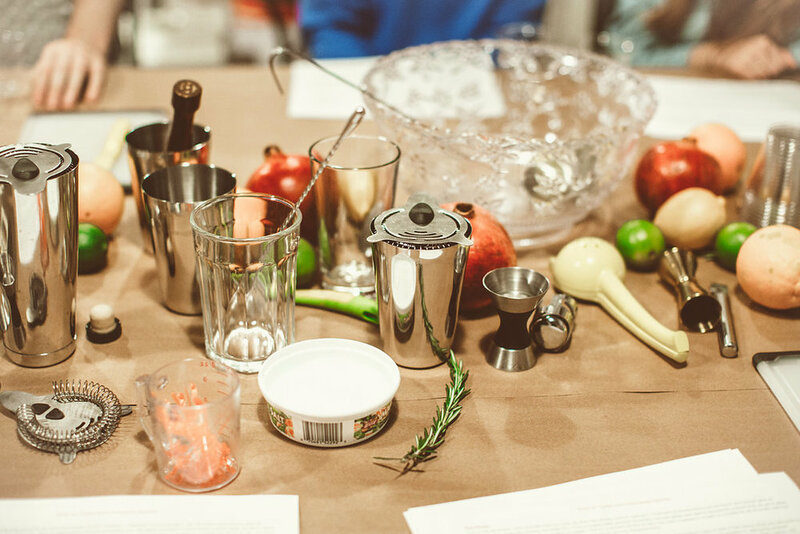 They offer personalized cocktail making classes as well-- what a fun way to get your friends together and for only $30 per attendee! If you are a cocktail making novice, don’t sweat it, Joni, owner of Mint and Mirth starts all of her classes with a list of important ‘Drink Terminology’ and is happy to answer your most burning cocktail questions (such as what is the best bang for your buck tequila--which she happily shared the industry favorite is Omeca Altos). Next we learned how to taste and compare spirits; sipping the gin to detect its flavor profile! Joni explains this step is about: 1. The Nose 2. The Palate and 3. The Finish. Together we created the two recipes which I share below and let me tell you, they do not disappoint! Homemade pomegranate syrup adds an earthy-sweet nuance to the classic margarita. If you are short on time, skip the Pomegranate Syrup and instead muddle pomegranate seeds and a sugar cube before adding your liquids and shake. *Pro Tip: shake until the shaker is frosty on the outside! 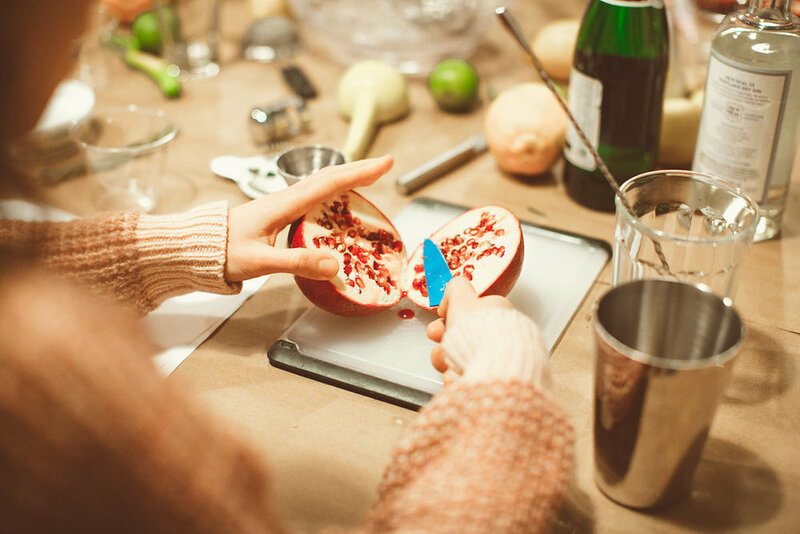 This easy pomegranate syrup can make a great addition to any winter cocktail. Cut the pomegranates in quarters, to remove the seeds. In a small pot, bring the pomegranate seeds to a boil with the water and sugar, lower the heat and let simmer until the syrup has reduced by half. Let cool to room temperature and strain into a clean glass jar. Keep refrigerated for up to 2 weeks. Cheery, wintry citrus is perfect in this pomegranate punch, not only for its color but also for the brightness it brings to the recipe. It’s easy to double if you’re expecting a large crowd. Add ice and sparkling wine at the last minute, just before serving. Serves 4.